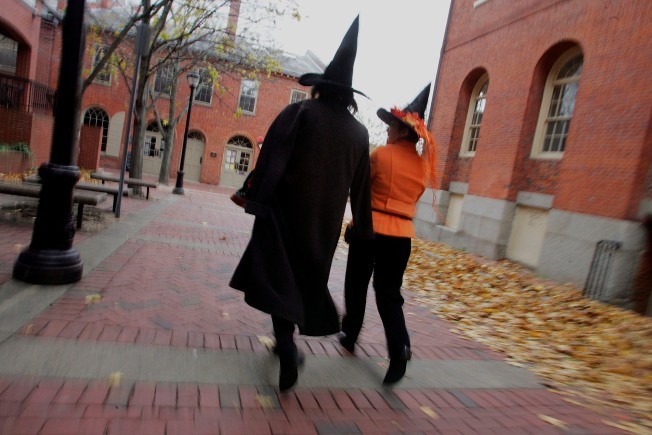 Costumed people dressed as witches walk though the street next to the old Town Hall as they visit the town where, back in 1692, witch trials took place in Salem, Massachusetts. When you think of Salem, it's only natural that witches come to mind, which is why the Massahcusetts city is once again preparing for a busy Halloween weekend. Officials are preparing enhanced security as they anticipate large crowds of tourists for the annual celebration of Halloween on Oct. 31. And, fair weather is forecast for the final night of the city's Haunted Happenings celebration. There will be free live music performed on stages around town, in addition to a carnival on Derby Street and many attractions in the downtown area. People planning to celebrate Halloween in Salem are encouraged to arrive early, avoid traffic by taking public transportation and leave costume weapons at home. Click here for the schedule of public events and public safety information. Downtown roads in Salem will be closed as early as noon to accommodate the crowds. Closure decisions will be based on public safety needs. Click here for a complete list of road closures. You should call police at (978) 744-1212 to report any suspicious activity. You may also visit one of the bright orange Salem Police tents throughout downtown. You may also text a tip from your mobile phone by texting 67383 and entering SalemTip with your tip. And, most importantly, have a "spook-tacular" Halloween!